Football is by far and away the world’s most popular sport. Luckily, there’s more to life than football. With hundreds of different sports played on a daily basis, even if you’re the ultimate sports nut you won’t have heard of some of these obscure sports from around the world. 11 What Makes These The Most Obscure Sports Around The World? These sports aren’t totally random played once a decade. People play these sports regularly. Yes, really! This game is hectic! A combination of volleyball, football, martial arts and gymnastics. The top athletes in this sport are risking injury seemingly every point as they twist their bodies in crazy ways not knowing exactly how they’ll land. The sport has been around for a few centuries, but it wasn’t until the 1960’s that the game started to become standardised with a set of rules each country agreed to follow as the Asian Sepak Takraw Federation (ASTAF) was created. Today the sport is one of the highlights of the Asian Games and Southeast Asian Games with Malaysia and Thailand the top countries in the sport. The sport is rapidly growing with associations in Europe, Australia, and the States contributing towards making it mainstream. The Asian countries would love to see it included in the Olympics, me to even if it’s a confusing sport to the masses. Having travelled through Asia a fair bit, I’ve seen a few Takraw balls around the place but didn’t realise that was what they were for. That’s probably for the best as I’d be bound to injure myself in 90 seconds flat. You’re familiar with dragon boat racing yea? Snake boat racing does it best to dwarf dragon boat racing. All snake boat designs are unique and at 100+ foot long (30+ metres) they cover the 1.4km race distance in about 5 minutes (takes a bit over 8 minutes for the best in the world to do 2km on a dragon boat). The traditions of snake boat racing date back over 300 years, but nowadays there are numerous racing festivals held on the backwaters of Kerala. Over 40 boats compete in most races with teams training in the weeks leading up to the events held between July – September eager to represent their villages strongly. I heard of this sport when reading a brochure on my trip to Kerala in March, gutted to know we wouldn’t see any of the action in and around Alleppey. The races are becoming a tourist attraction in Kerala. The four biggest race dates can be found here. Originally known as the Lingerie Football League, the sport has been rebranded as the Legends Football League in 2012. And has taken the world by storm. Launched in 2009, I think it’s fair to say, including the word lingerie in the brand helped gain traction before maturing into an evergreen sport played in Canada, Aussie and the USA. Many of the 2009 competitors barely knew the rules of lingerie football. Fast forward to 2017 and there are some serious skills shown in the game, with just as much excitement for spectators who, let’s be honest, didn’t all show up to see the skills in 2009. As part of the rebrand, apparel was changed from lingerie to performance clothing although the amount of skin showing hasn’t really changed. As the skill levels increase each year, many athletes are coming over with a professional background in sports like athletics, volleyball, softball, football, and basketball. If you aren’t from Ireland or Australia, this is one of the weirdest sports in the world. It is plain confusing. If you’re from there, it still probably doesn’t make 100% sense. The sport is played using most of the rules from Australia Rules Football (AFL) while using the field, ball, and uniform from Gaelic Football. The biggest series between Aussie and the Irish is a best of three played in October/November each year. While it isn’t a massive passionate contest, both teams are representing their nation and don’t want to lose. Elsewhere in the world, it is played by communities where there are a small number of players in both Gaelic football and Australian rules football. I saw the series in 2011 played at Melbourne’s Etihad Stadium. I don’t understand Aussie rules at the best of times and have hardly watched Gaelic football in my life. It’s fair to say this was a bizarre sport to watch let alone try and play. I don’t recall much of what happened in 2004. But I do vividly remember Marc Ellis winning the Cooper’s Hill Cheese Rolling Competition. It’s a rather stupid sporting occasion held on the English bank holiday in May. The contestants hurl themselves down a hill chasing a 3-4 kilo wheel of cheese. The stadium hill near Gloucester is steeper than your average ski slope with just a days preparation required. Preparation means clearing the overgrowth and making sure no obvious dangers (sticks and stones break bones) are about. Anyone can enter the race as thousands watch on with the St. Johns ambulance usually taking a few casualties away with them each year. The traditions of cheese rolling are not known, but it’s pretty darn silly (meaning secretly awesome)! If they ever introduce a soy cheese wheel, who knows, I’ve been known to do the odd silly thing from time to time. Although, I’m not sure what’s more silly, the race or the official website. In fairness, there must be some skill to it, Chris Anderson is an awfully consistent winner! This time we go back to ancient India when Kabaddi was first played. I liken it to a game you would make up in the school playground, I tended to compete in breath holding competitions a lot back then. Bragging rights are a currency in school! Centuries later in the 1950’s the rules of Kabaddi were formalised and today the main countries playing are India, Nepal, Japan, Malaysia, and Bangladesh (their national sport). In essence, there are two teams, one on each side of the court each trying to play tag. One player at a time goes into the opposition territory to try and tag them without being tackled before returning back to the home court. You must hold your breath when you’re in the opposition’s zone by repeating saying Kabaddi. Take a breath, you lose (that’s the crazy part). I’ve seen this played on the banks of Kerala’s backwaters, I’d have loved playing this obscure sport as a kid. The is a brilliant spectator sport and there’s a number of pro series and championships held every year! The full rules of Kabaddi on WikiHow were surprisingly well explained. Surfing on snow. That was the idea behind snurfing when it was invented in 1965. The sport has never had participation in large numbers but can claim to have been the predecessor to snowboarding which started in the 80’s and 90’s. Now in the 2010’s snurfing has started to make a comeback! Once you’re ready, simply wax the bottom of the board, jump on, grab the rope and go. You control the board with the rope (and shifting weight) while you gain speed (30+ mph possible) by lifting the nose. To slow down you either drag a toe behind the board or slide to a stop like a baseball player into base. If you want to be a world champion, Snurfing might be your best bet! Check out SnurferBoards.com for the next world champs in Vermont. With over 40 rules and the Colombian Senate declaring Tejo the national sport of Colombia, you can assume Tejo to be fairly formal. But as you’ll see in the video above when that national sport involves players throwing rocks at gunpowder while drinking beer it’s not exactly your traditional definition of formal. That makes Tejo one of the most cultural sports around the world you’ll ever find. It’s like they’ve taken the traditions of beer drinking dart players and injected more ‘man’ into the sport. Tejo has been around for centuries, with national teams competing for tens of thousands of dollars. It doesn’t take a rocket scientist to work out beer companies are the biggest supplier of sponsorship. On a local level, there are Tejo arena’s found all around the country where the sport isn’t as it sounds. The basic concept: players attempt to throw a rock into a ring inserted onto the clay board, lined with gunpowder. I liken the sport to extreme petanque? Would you really be surprised if I told you numerous hostels around the country have realised the appeal and organise trips to arenas weekly? There’s a nice piece written about Tejo on Anthony Bourdain’s, Explore Parts Unknown website. Baseball is one America’s favourite sports, but a lot of people find the game boring. If you do, you and Lauri “Thako” Pihkala have something in the common. In the 1920’s he returned to Finland and in the 1920’s decided to create his own version of baseball, Pesäpallo. Pesäpallo is considered one of Finland’s national sports, and to be honest from the video below it looks more confusing (because I’m not familiar with the sport) but more action paced than baseball. The game is played in Finland, Australia, Canada, India and other parts of Europe. As such, there is a World Cup held every three years(2012, 2015, 2018 etc). The vertical pitching makes this a very obscure sport in my books. *This is the Chinese name for the sport, there are many other names for the game around the world. 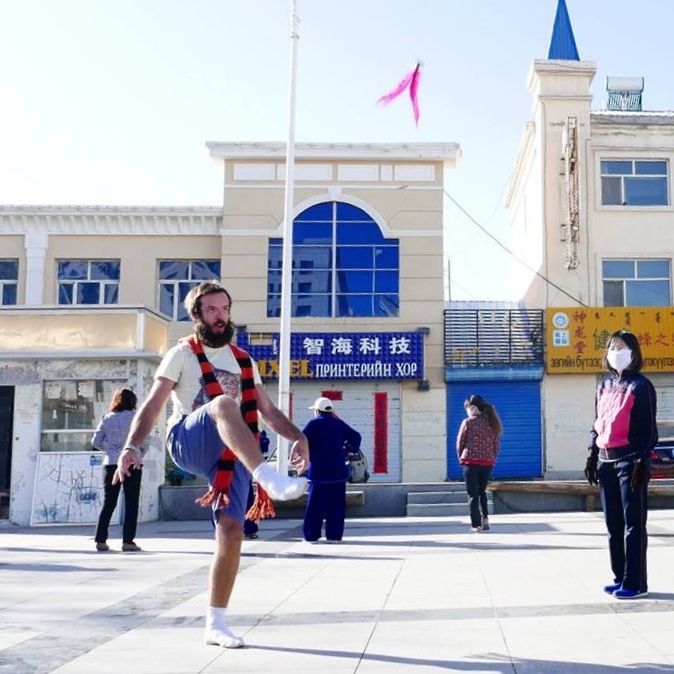 If you consider yourself a fairly good hacky sack player, you might back yourself as a good Jianzi player. The sport originated in China, before spreading through Asia and now Europe. I played Jianzi on a chilly cold morning on the Chinese-Mongolian border. Not that I knew what game I was playing at the time. If you want to create a formal game, you split teams up and are on either side of a center line. On a competitive game, there are formal competitions and Jianzi is sometimes played in the Southeast Asian Games. Like the ease of the game? Of course on Amazon you can buy Jianzi shuttlecocks. 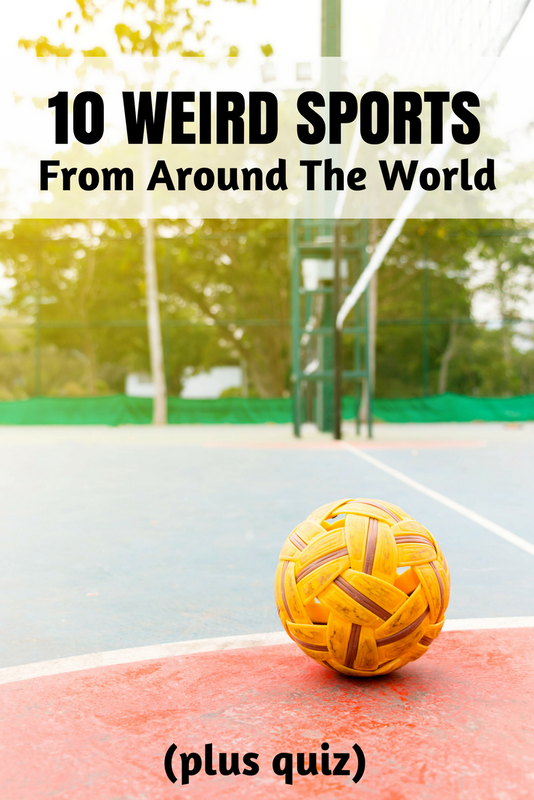 Well there you go, 10 of the more obscure sports I’ve discovered from around the world. What Makes These The Most Obscure Sports Around The World? This is totally subjective of course but my initial list of unusual sports around the world was 30 sports long. I decided to choose 10, even though I was gutted to miss Kok Baru which is one of the most unique sports around the world. Your turn. What is the weirdest sport you’ve heard of? I want to know! Be a good sport and pin this post. Hehehe! Quite interesting. The cheese roll though, funny. Thanks for sharing. It’s crazy how many sports are out there. What an awesome world we live in right?